In the past, a tag line and / or logo was what identified a brand. But, in recent years many brands also use a person or character to build a relationship with their target audience. And, many brand building experts state that it is easier to build a brand around a person than an inanimate object such as a logo. People naturally respond to a person they like and tend to build a relationship with them while it takes a long time to market a logo to get the same consumer reaction. 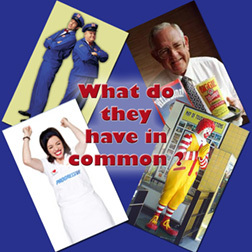 That is why a person (s) or character is often associated with the brand such as Ronald McDonald for MacDonalds fast food chain, Flo* for Progressive auto insurance, Dave Thomas (before his death) for Wendy's fast food chain, and the Maytag repairman** for Maytag washing and drying machines. * "The Popularity of Progressive's perky insurance clerk shines again"
The same technique can be used by artists to build their brands. Artist Thomas Kinkade knew how important it was to market himself to extend his art brand. He did a copious amount of personal appearances, youtube.com videos, and made sure that pictures of himself were placed in advertisements, press releases, and on products. Thus, even though his tag line "painter of light" is the most recognized method in identifying the Thomas Kinkade brand, a picture of Thom on product hang-tags is also a very important identifier. Note: Even though personal marketing is important to extend a brand, all the other methods used in branding is also valid. Below is a list of excellent resources about what is branding, various ways to brand, and interesting articles about several "super" licensed brands. Not all the articles are aimed at the art licensing industry but they do contain valuable information and can be applied to branding art. – "Brand Yourself for Success in Art Licensing Teleseminar with Paul Brent"
• Articles in License Global magazine issues about super brands - these take a while to start. – "Swimming with a Savvy Shark" (p. 30-31) Discussion on branding and tips from Daymond John of reality TV show "Shark Tank." – "Brand Stars" (p. 22-24) Discussion on brands, marketing and products that are on television including the reality TV show Fashion Star. – "Kathy Ireland Super Brand" (p. 60-62) Discussion on how kathy Ireland became a super lifestyle brand with $2 billion in retail sales of licensed products in 2011. – "What is a Brand? Part 1: 5 Factors that Define a Brand"
– "How to Brand - Part 1: Research the Market and Consumers"
– "How to Brand - Part 2: Identify Brand Values"
– "How to Brand - Part 3: Create Brand Messages and Brand Images"
– "How to Brand - Part 4: Educate People about Your Brand"
– "How to Brand - Part 5: Devlop Emotional Involvement and Branded Experiences"
– "How to Brand - Part 6: Monitor Brand Perception"
The SURTEX show is the marketplace where manufacturers look for original art and design for their products. The show will be held May 19-21, 2013 at the Jacob K. Javits Convention Center in NY. The Surtex website (surtex.com) is the place to find out what is offered when attending the show such as a listing of artists, agents and companies that will be exhibiting their art and surface patterns. The site also describes other activities such as free daily color, textile, designs and theme trend seminars; ten licensing seminars that attendees can sign-up for; the annual designext® (International Student Design Competition); and the opportunity to visit three wholesale shows at the same time (National Stationery Show, International Contemporary Furniture Fair, Creative & Lifestyle Arts) in the same venue. But, if you cannot attend SURTEX, the SURTEX website site is also a great resource in learning about the show and about the art licensing industry. The site has slide shows of 2012 exhibitor booths, exhibitor happy hour pictures, and the winners of designext®. On the site are also links to youtube.com videos about SURTEX, links to trendease.tv Podcasts by licensing experts on different aspects of the industry, guest articles by licensing experts, and SURTEX newsletter "On the Surface" archives of past newsletters. See below for more information about these resources. Below is a list of the latest articles in the Guest Blog section of the website. But, there are many more articles. • "Tips on Collection Building from Khristian A. Howell"
The SURTEX newsletter "On the Surface" is posted regularly throughout the year. Past issues may be viewed by clicking HERE. You can subscribe to the FREE issues that are automatically sent via e-mail. Below are descriptions of Podcasts by art licensing experts about different phases of the industry. Podcasts 1 - 8 are sponsored by SURTEX. Do you ever wonder where patterns, motifs, and surface interest come from? Fashion, papergoods, seasonal items, home decor including textiles, tabletop, wallcoverings and more--they all get their aesthetic from somewhere. It starts here with art. In this interview learn where to find that art, who uses it, how it is applied, and how it acts as a crystal ball. Klein Designs represents a selection of artists from around the UK specializing in surface pattern. Michelle, with a degree in Fashion & Printed Textile Design from the renowned St. Martins School of Art, talks about her experiences selling designs and unveils many key trends for the coming seasons. Listen and learn. Trendease speaks with the seasonal buyer at BJ's Wholesale Club to understand more about how original art plays into their business strategy to offer customers unique products that they cannot find anywhere else at a very competitive value. From holiday items to outdoor objects, art is part of the product development cycle. Also learn about the latest Christmas green! Known as one of the "100 Most Influential Players" in licensing, Principal of MHS Licensing and former Licensing Director at Target, John Haesler talks with Trendease about the keys to success in his line of business. From noting the value of intellectual property to design and market trends, these pearls of wisdom are worth a listen. In this podcast trend forecaster Milou Ket shares her sources of inspiration and how she communicates design directions to her clients. She also talks about her upcoming presentations at Surtex, giving highlights of the six trends to be presented for 2013-14 including Harmony & Balance, Sensual & Passionate, Bright Kaleidoscope, and Nocturnal Luxury. Quilting may have the stereotype of being old-fashion, but that perception is changing! Learn about how a company working with styles ranging from 18th century to modern and hip is sourcing and selling fabrics to a shifting marketplace. Also understand how a trade show can influence the dynamics between a president of a division and its design team. MaryJane has been running her own design studio for almost 30 years. 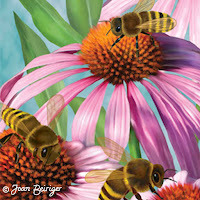 Her artwork has graced many product categories from textiles, wall décor, ceramics, to furniture. In this podcast she gives tips on exhibiting, using an agent, and talks about market shifts from the growing designer pet industry to the colorways for children’s fashions. The first thing that comes to mind when one thinks about selling art for surface design may not be intellectual property, but the reality is that IP rights are incredibly important in the business of selling designs. In this podcast Maurice Moss, partner at Barton LLP, specializing in commercial, IP and patent litigation, gives us invaluable advice on copyright and licensing. The videos showcase SURTEX booths, comments by exhibitors and other art licensing experts. Note: At the time this article was posted a selection of videos was on the surtex.com front page after "The Buzz of SURTEX 2012" finished playing. However, the link may be later moved or deleted. If the video is no longer on the page, go to youtube.com and search for "surtex" to view the videos.